Welcome to the My Monthly Hero Blog Hop. March has brought the most adorable kit full of stamps, dies and ink. I have a couple cards to share using this kit and the add-ons. Keep scrolling to see my projects and to check out the giveaway! The kit value is $75.99 but retails at $34.99. Grab a kit HERE before they are gone! You can subscribe to the My Monthly Hero Kit and ensure that it is mailed to you each month. Click HERE to subscribe. When I first opened up the box from Hero Arts and I saw this Bubbles Bold Print Background (its an add-on this month)....I knew I had to use it!! Isn't adorable? To create this card, I heat embossed the bubble background on white Neenah cardstock with Hero Arts White Embossing Powder. Next, I grabbed the Life Changing Blending Brushes and added in some Peacock Feathers Broken China Distress Inks to the background. Talk about a smooth blend! Next, I die the Hello Message Fancy Die in white Neenah and again in fun foam. I used the fun foam to add some dimension to the sentient. I colored up the little adorable little fish from the add-on set Pet Gold Fish and tucked it behind the hello. This way she looks like a shy little fish peeking out. I used the Blue and Green Droplets in the background for little pops of color. I popped the card front up on a white card base and left just a little white showing along the bottom. 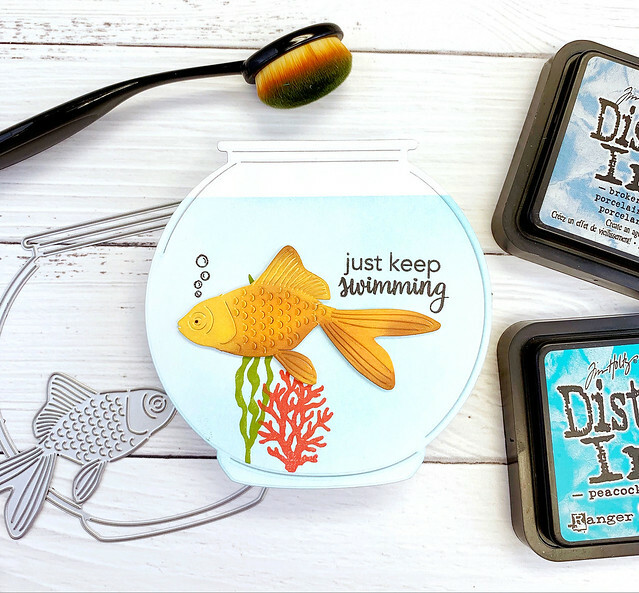 This is a die set with the bowl and the fish included. I created a shaped card using the bowl and then masked off the top of the bowl. I grabbed those Life Changing Brushes again and blending in the Peacock Feathers and the Broken China to create the water. I used Carbed Pumpkin and Fossilized Amber Distress Inks to blend color onto the goldfish die cut. I used a piercing tool to pop up the scales on the fish to give it some dimension. 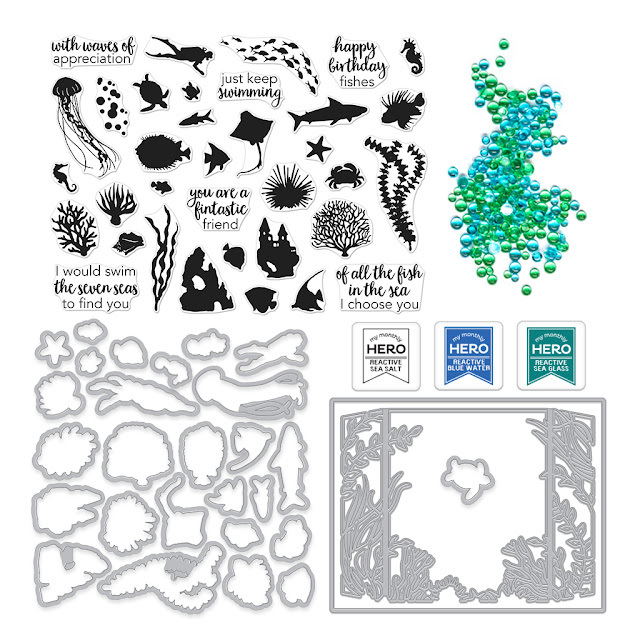 I stamped the coral and sea weed from the main kit stamp set directly on the fish bowl. I added in the sentiment and bubbles in black. Last, I popped up the fish on the bowl with foam tape. Click HERE To shop the Add-ons. We are giving away one kit as a prize to one blog reader - selected from the comments across all of the blogs in the hop. The giveaway closes Sunday, March 10th at 11:59pm, and the winner will be announced the following week on the Hero Arts blog. So glad you stopped in today! Hope you have a great week! Pretty cards. It makes me want to buy all the add-ons! 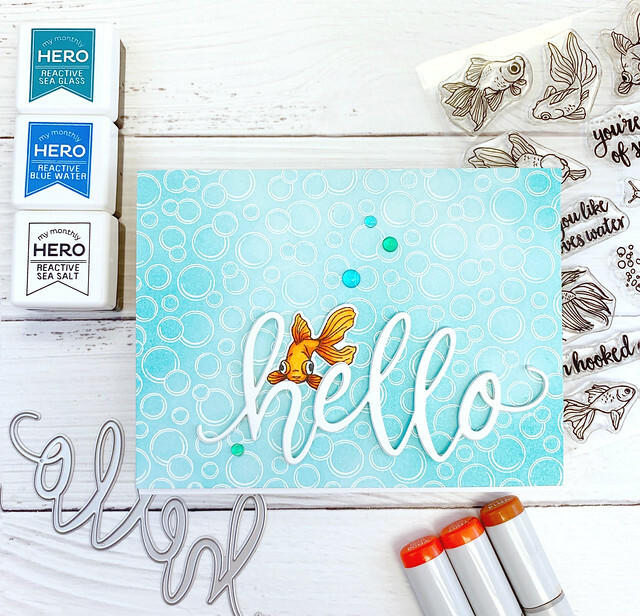 What a fun Hero Arts Kit for March!! Love all the add-ons with this kit. 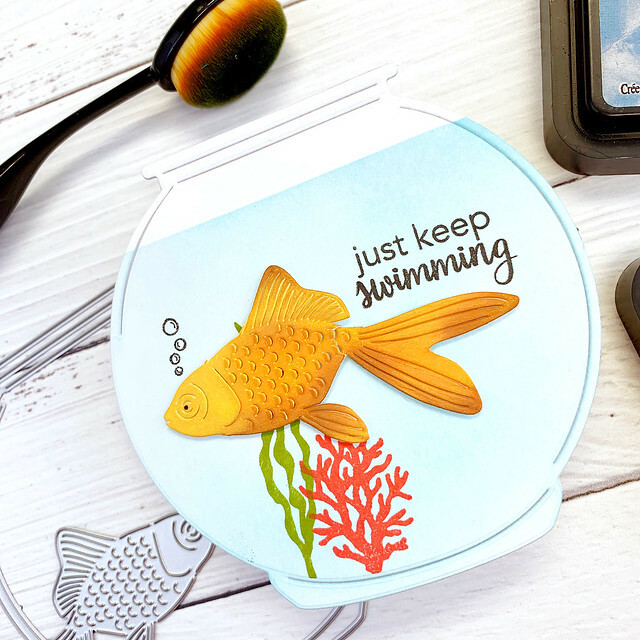 Your little goldfish peeking thru the hello sentiment is adorable and the goldfish shaped die is awesome in so many ways. Thanks for sharing your inspired designs. Both your cards are great, but I LOVE that hello card - it's perfect! Lovely cards. I liked the embossing with the background stamp. One more stamp I wish I had ordered today! This kit and add-ones are truly amazing. Your cards are too. I really like the bubble background. Very fun cards! Love your inspiration for this awesome new kit! I really, really love the bubbles!!!!!!!!!!!!!!!!! Two very cute cards. Can’t wait for my kit to arrive. Love your cards! Didn't think I "needed" any add ons. Now not so sure. That bubble background is pretty sweet! Your cards are really cute! Love this stamp and die set! That's really cool that you can add dimension to the fish by bending his scales! These are terrific Laurie! Love the fish bowl! I love the idea of a fish tank shaped card. Beautiful colors on both of the designs. Love that paper layering gold fish. Sch a great release. These are just beautiful, love the pretty colors and fabulous designs! So cute! Love the goldfish in the fish tank! Super cute! Laurie, love your use of this fun and cheerful kit from Hero Arts! Thanks for the great ideas. Wasn't sure how many things I could order but knew I had to have the Pet Goldfish when I saw your card--so adorable!! Aww, your cards are so cute! 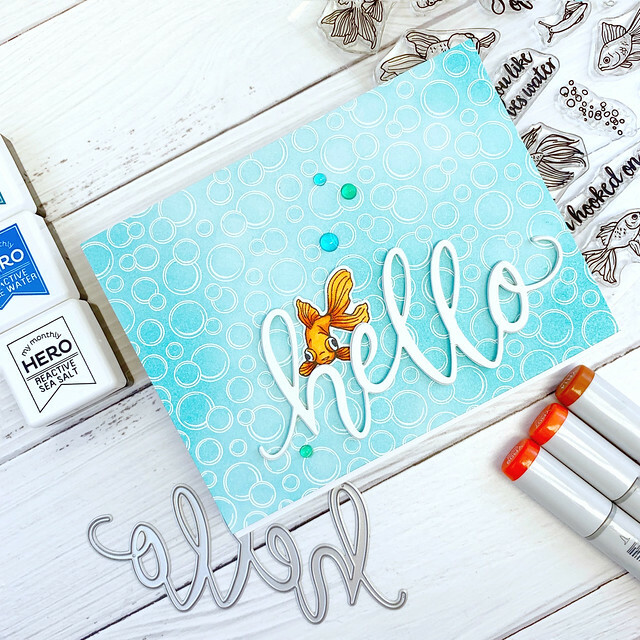 Love the Hello fish card! Thanks for sharing! Love the bubbles background and the fish bowl! Such a fun new release from Hero Arts. Great new MMH kit. Thanks for sharing with us!! The goldfish on both cards are awesome! I love the fun shape of the fishbowl card. So cute! Oh Laurie, super cute goldfish cards...I especially loved the Hello card.....just adorable. Loved the colors...this kit is just great....I want all of the add ons...but...that will have to be later....budget time. Thank you for sharing your awesome cards! Such a pretty set of cards, I love how soft the inking is in the blue. Love your cards, especially the little goldfish saying "hello". Lovely background with the bubbles and blending. TFS! Love both of these fish cards. Oh my gosh! That little goldfish is staring right at me! So cute!!!! Love that bubble background, and the fish are adorable. These are such cute cards. The first card is my favorite! So cute and clean. Absolutely love your cards Laurie! The new kit and ad ons are fabulous, thanks for the inspiration! Gorgeous cards. The first one is amazing. Liked the Hello Fish card. I love everything in this kit plus the add ons! Beautiful cards, love the fish bowl cutout. Your hello card is so adorable, just love! Thanks for sharing! I really like your first card, the hello card. I got a big chuckle seeing the goldfish Looking at me with those Big Eyes! Gorgeous cards! I love the pop of the fish on the first one. Great designs! I love your fishbowl! The goldfish is amazing! Super fun cards and kit!! These are both fabulous!!! I do love that first one with the fabulous bubble background! I like the simplicity of your awesome cards. This has to be one of the best kits and your cards are joy to look at. Lovely. You've shared lovely cards that really showcase the beauty of this fun kit. Thanks for sharing your creativity. Love, love, love both of these cards! Especially that first one with that fish peeking out from behind the sentiment!! Lovely cards - I really love the bubbly background of the first card and that cute little goldfish! What an amazing kit and cards! Pretty cards you made with this kit! I love the Hello card!